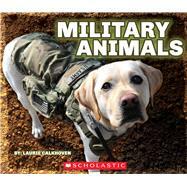 In MILITARY ANIMALS, you will learn all about these incredible animals that have aided the military in the air, on land, and by sea. Discover how dolphins, bears, pigs, penguins, and even glowworms became heroes in times of war. When technology couldn't help, these amazing animals could! MILITARY ANIMALS showcases these true, hard-to-believe heroic animal stories, accompanied by awesome, action-packed photos. Each book even comes with a collectible paw-print dog tag necklace! Laurie Calkhoven is a children's writer and editor living in New York City. She has written many historical children's books including George Washington: An American Life and Harriet Tubman: Leading the Way to Freedom. You can visit her at www.lauriecalkhoven.com.